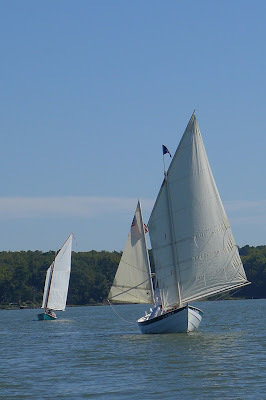 Last weekend Annie and I ventured out for the second time with new spars and 'new to me' sails. My friend Steve the musician had gone with us on this first 're'shakedown. Heading back from a nice beach exploration north of The Hole in the Wall, the port shroud parted at the deck end swage fitting. I had pressed the fittings myself copying the original (fire damaged) shrouds. We quickly backed over to the opposite tack and got the mast down before the tabernacle was damaged. We headed to shore, over for the day and back at the marine store. There was surplus wire to extend all the eyes enough to double up on swaged sleeves. Not a good experience but lucky to be close in and to have crew support. 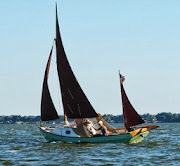 Back to last weekend... another good friend Peter invited me to join the Old Bay chapter of the Traditional Small Craft Association for a meetup on the Rappahannock River. The group included a number of sailing mates that had helped me with the studio rebuild. 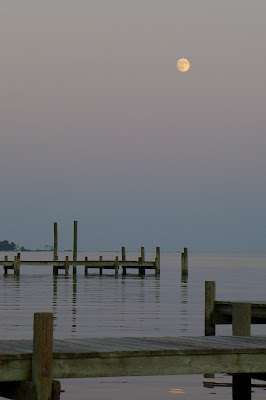 The rendezvous was Belle Isle State Park located up river from Urbanna, Virginia. I left out early Friday and, upon reaching Gwynns Island, made a few modifications including fastening new mahogany jib sheet cleat pads. This raised the cleats enough to clear the newly replaced cockpit cushions. 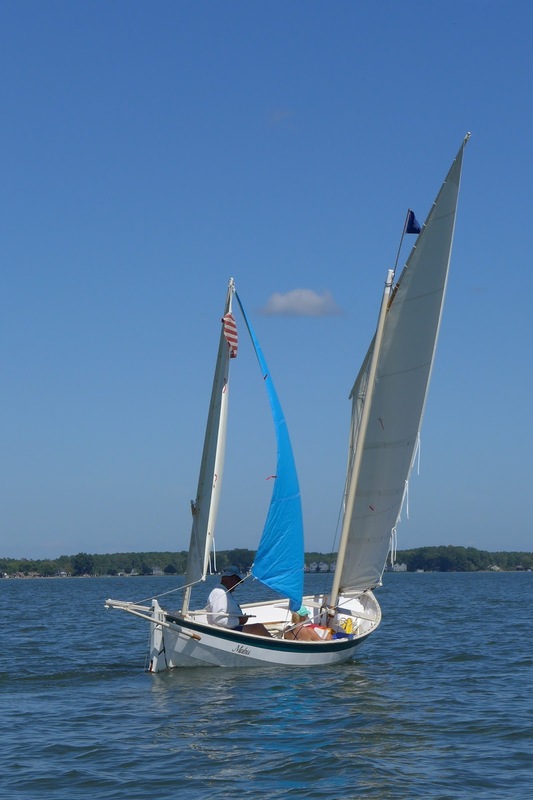 The rigging was reattached and we were off to Urbanna to launch. While Annie rested at the ramp dock I stashed the road rig in town. Out through the harbor and long tacks up river led to the campground. It took about 4 hours but I surely didn't care. We were out and moving again. It has been nine months since the fire and it seemed like a dream. I found the dock and parking lot full of beautiful, traditional wooden boats. A pot luck was underway in a nearby screen room and old friends were glad to see me. What's not to like. After quite a feast I steered Annie up the adjoining creek to anchor for the night. Even though we are having an indian summer, it was cool enough to make for a good night's sleep. 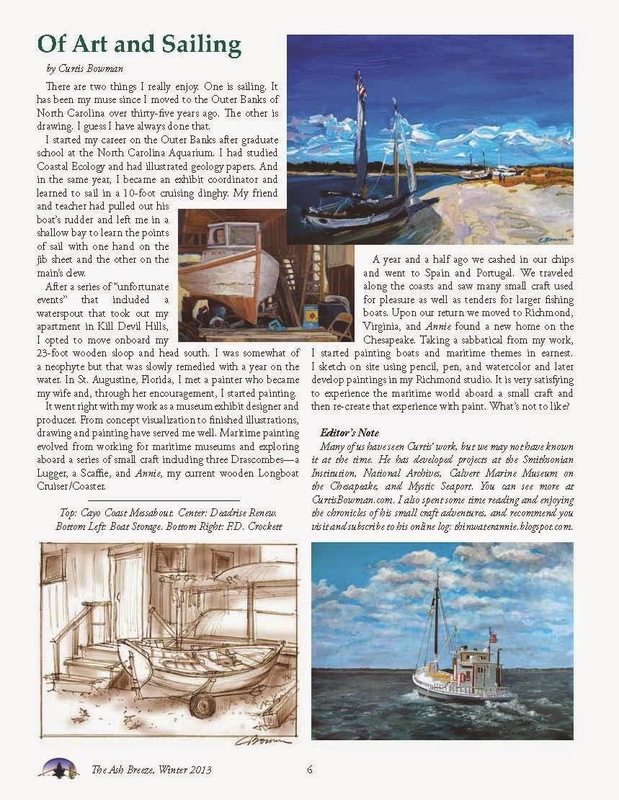 The next day I jumped on board my friend Peter's Caldonia yawl Nip. Along with the other boats, we all made way across the river to a deserted beach backed by a towering clay wall that had formed by erosion. After a snack lunch we headed back picking up a fresh breeze with a few sneaky gusts to challenge the 'captain'. Held fast. It was decided that we would go as a pack to a restaurant deep in the Northern neck. A colonial house with plenty of fresh seafood including fine oysters. On return I anchored Annie back up the creek for the night. 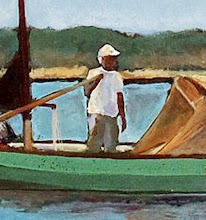 In the morning we were away, sailing alone back down the river. The gifted sails she was carrying are not the perfect fit but are much appreciated and we managed. 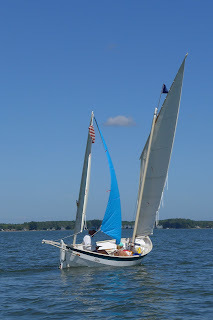 She will have a new set as soon as I can find a suitable sailmaker. That's another day, another post.